Like the Great Pyramids, the Hoffer HO Precision Series Turbine Flowmeters and API Series of turbine flowmeters are created to last. Superior engineering is the backbone of these products. We are so confident that our HO Series and API Series will perform over time that we are offering a 5-year warranty. No other company in the industry is willing to stand behind the quality of their meters like Hoffer Flow Control. What will you look like in 5 years? How about 20? We regularly see meters come back for yearly calibrations that have been in service more than 20 years. Guaranteeing our meters for five years was an easy decision. We see fewer than 1/10th of one percent of our meters returned for repair. Over 45 years of continued success and performance speaks for itself, but for those that still have doubts, we offer our guarantee as proof of our reliability. Hundreds of thousands of Hoffer flow meters in the field quietly attest to our commitment to quality. Nothing beats the affordability, accuracy and performance that thousands of Hoffer customers around the world have come to depend on. We truly believe “performance is the way to customer satisfaction”. Read on to see how Hoffer flowmeters have proven themselves to be the choice for accuracy and reliability. 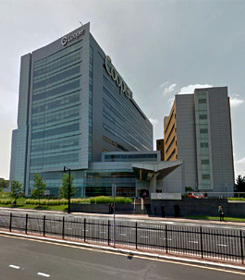 When Cooper Hospital of Camden, New Jersey equipped their boiler room with multiple Hoffer turbine flowmeters for use in their energy management system, they were looking for efficient and cost effective flowmeters. Hoffer flowmeters provide dependable and accurate BTU information that allows Cooper to manage their energy needs. When asked about the flow systems efficiency, Mr. Von Broadley, Chief Engineer at Cooper Hospital stated, “My boiler room system continues to be operational with the Hoffer flow systems. The flowmeters have performed well and I have no complaints.” The Hoffer turbine flowmeters are used on condensate return, natural gas, and also on #2 fuel oil. Flowmeters from the HO Series of in-line liquid and gas turbine flowmeters and the HP Series of insertion turbine flowmeters are included in the boiler room at Cooper. Additionally, numerous totalizer/rate indicator units were supplied along with the original flowmeters. The Cooper Hospital boiler room encompasses a number of operations where accurate, dependable flow measurement allows the engineering and maintenance personnel to manage the efficiency of the boiler room in the most optimum way. Hoffer turbine flowmeters are hard at work, 24 hours per day, 7 days per week, 52 weeks per year. So, when we say the ultimate test for any flowmeter is the ability to perform over an extended period of time, we mean it. Contact Hoffer today and put our flowmeters to work for you.